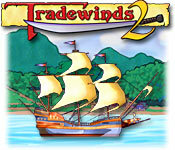 Tradewinds 2 expands on the basic gameplay in Tradewinds Classic with more artwork (more character portraits), the introduction of a fantasy element (magic items and voodoo), more involved stories for the playable characters, and more variety in sidequests than simply hunting down notorious pirates. The artwork here is romanticized 1700's Caribbean. This Tradewinds 2 fantasy game art page examines the random character portrait generator. Tradewinds 2 features a random character generator that randomizes names and portraits, taking into account the variables of Gender (male, female), Class (lower, middle, upper, pirate, upper pirate), and Ethnicity (white, black, Spanish, and mulatto). When you first try it, the game seems to churn out an infinite variety of characters, but after a while, you will notice a certain same-ness as you become familiar with the options. The clothing variations for Class are quite weak overall, some of them not stylish or fanciful enough for middle or upper class compared to the lower classes. Pirate and Upper Pirate (more or less Upper Class plus Pirate features) is where you're most likely to get eye patches and the only place to get parrots or monkey sidekicks.